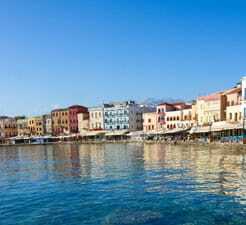 With our Ferry to Chania guide you will get all the info you need in order to plan your ferry crossing to Crete. Our unique ferry price comparison tool will compare numerous sailing departures around your preferred option with all available ferry companies as well as crossings to other destinations in addition to Chania to guarantee you have all the information you need to decide on which is the best option in one fast and easy search! Simply select your place of departure, preferred route, total number of passengers and search! "Athens to Crete easy sailing. " Boarding is far less formal than Cross Channel Ferries. Your arrive, you board your on!! The ships are bigger with more of an atmosphere to them. Food, as on all ferries, is expensive but the quality and variety is good and the staff very friendly, our cabin was clean and roomy. The sailing was very punctual and comfortable. all perfect, departure on time, big cabin. Recommended! You have been added to the directferries.com.au mailing list.